The eye mask is designed to block out light so users can relax and rest their eyes. The surface come into contact with eye is so cool and smooth like silk against your face. It allows healthy oxygen in while keeping dry air out, making you relax into a static state of peace and tranquility during travel, shift work, or in-bed. Besides, with built-in speaker, you can enjoy sooth music when take a nap, it is perfect for siesta and traveling. 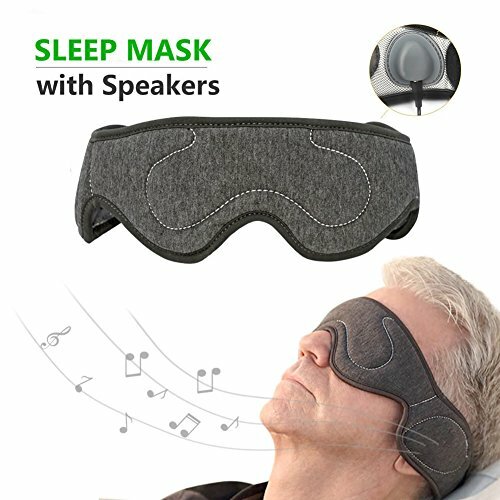 Unique headset speaker design makes you listen to music well when wearing the eye mask. With a 3.5mm Aux cable , compatible with all kinds of phones , and it is easy to connect the eye mask to the phone. Smaller than a cellphone, can be easily put in your tote or backpack, perfect for flight, train traveling. When wearing this eye mask, you can keep beauty as usual! – With YouTouchLife, you’re taking no risk with your purchase. We offer a 100% no risk money-back guarantee.